It was kind of sad to leave the paradise that is the Galapagos - but the sting of leaving was tempered by the fact that, oh, I don't know, we were leaving the islands to continue our amazing travels and see more of the Ecuador and the world?!? Don't hate me. Yes, I would stop reading after that last sentence too. But then I would come back and resume reading, because I would be way too curious as to what was going to happen next. 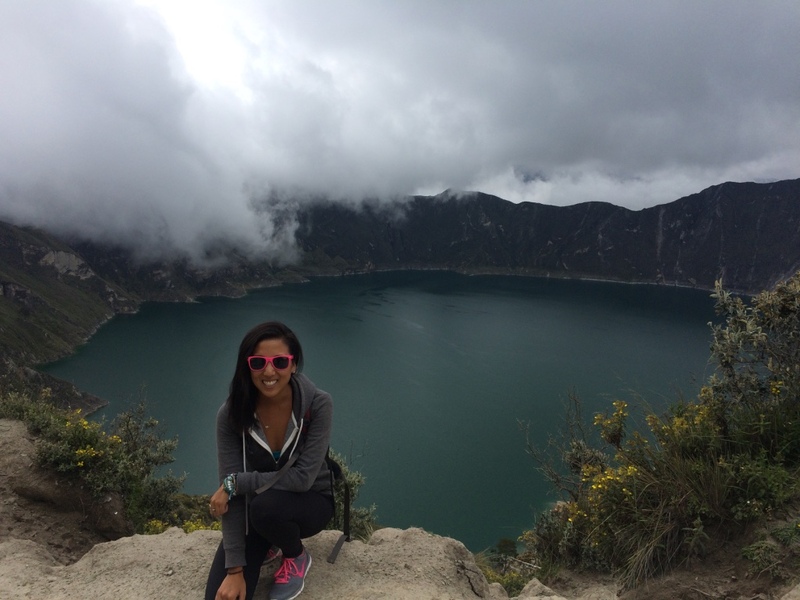 From the Galapagos, Nadine and I took a flight to Guayaquil, in the South of Ecuador, stayed for one night, and then took a 7-hour bus to the city of Baños. 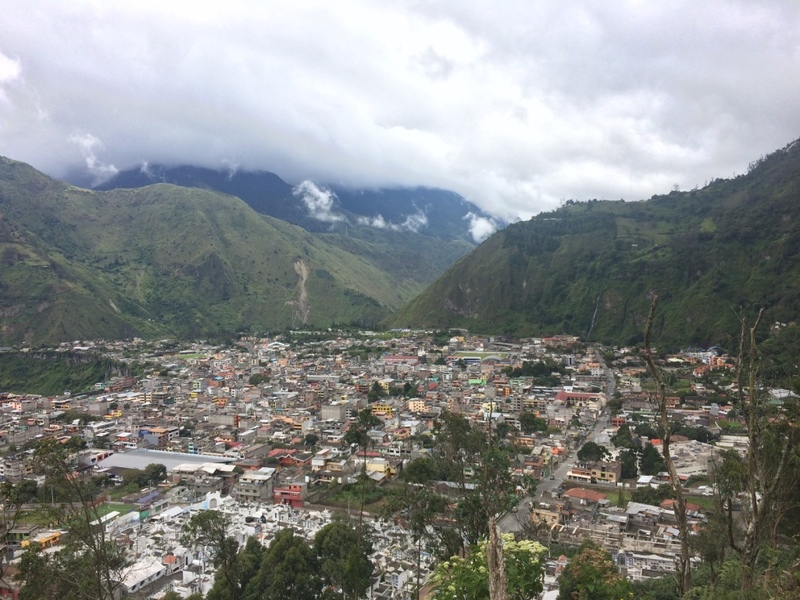 There's an actual city in Ecuador called Baños. Which means bathrooms, for those not in the know. Google tells me it also means baths, which actually makes sense, because the city is surrounded by natural hot springs. But colloquially, and for the sake of my point here, we went to a city called bathrooms. 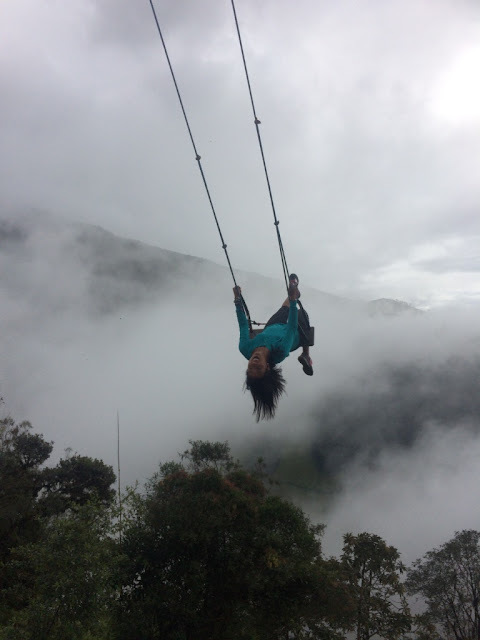 Baños, you are so cute! 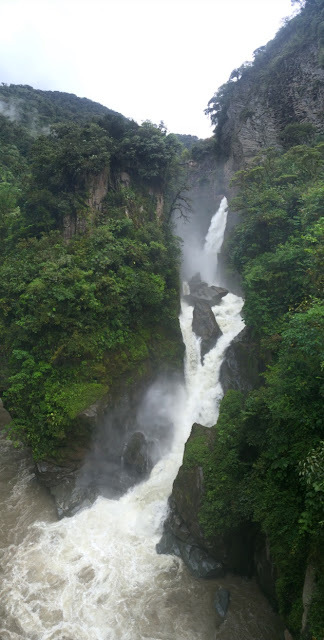 Baños is beautiful! 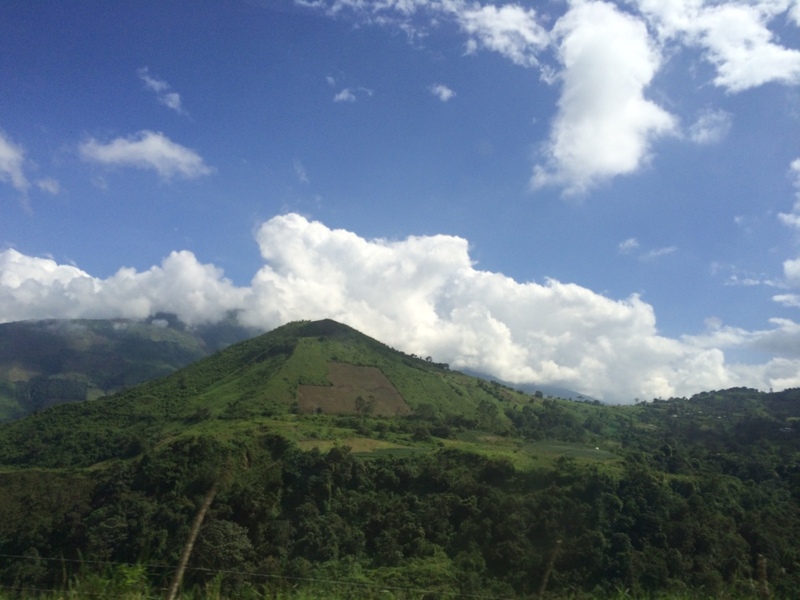 It's a little city tucked in the valley of these lush, green mountains (and a volcano somewhere), and it's best known as being a place to do a lot of adventure activities. You can horseback ride, rappel down waterfalls, bungee jump, kayak, whitewater raft, hike, zip-line, etc. 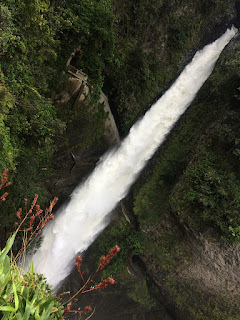 The downfall of backpacking for so long - I wasn't really dying to do tons of these activities because I've already done most of them (warning: further insufferable statements may follow) - but Nadine and I enjoyed our couple days in Baños anyhow. 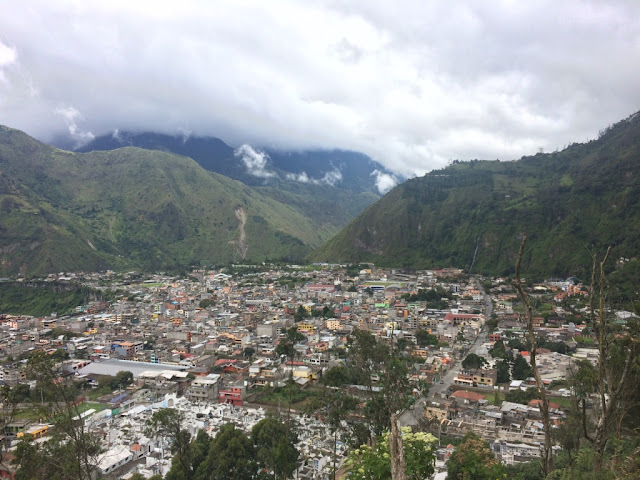 I actually loved Banos so much - it was one of those towns that's cozy and makes you feel right at home. There's charming cafés (with amazing, healthy food options), a lively nightlife, cheap spa treatments everywhere, and more nature than you could wish for. 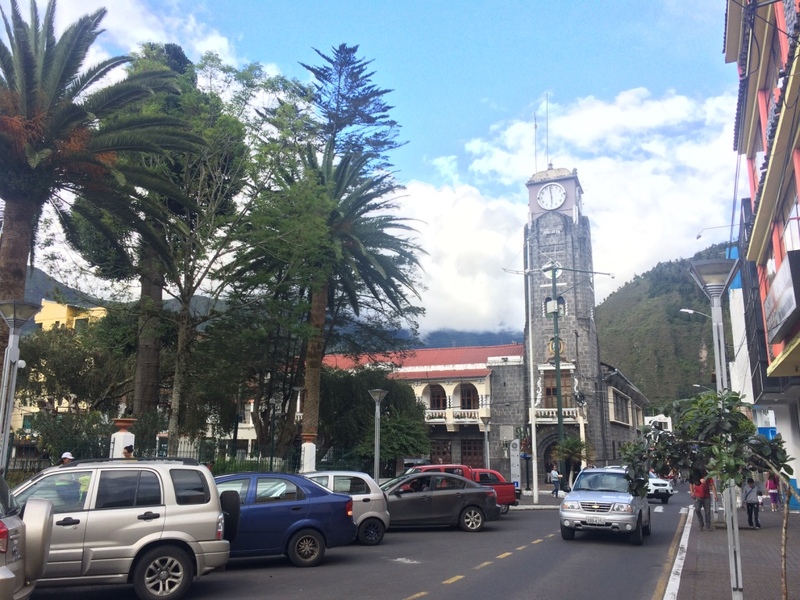 Arrived in Baños via a stunningly green bus ride, and spent some time wandering the city streets. Pretty scenery on the drive! 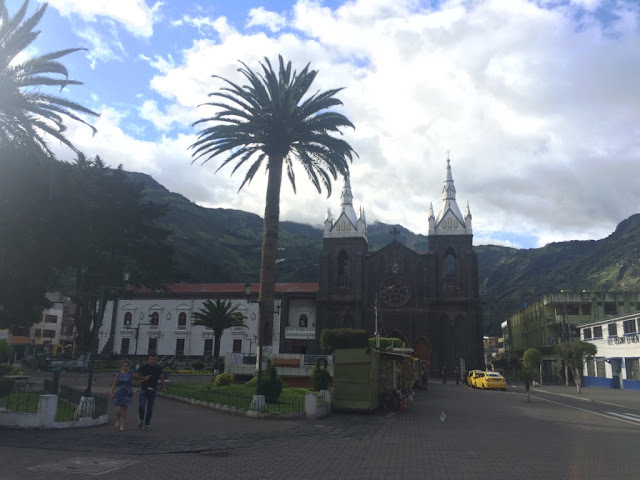 Every South American city has a main plaza with a giant church. 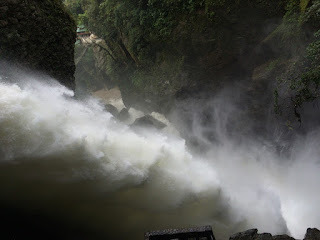 Here is Baños'. 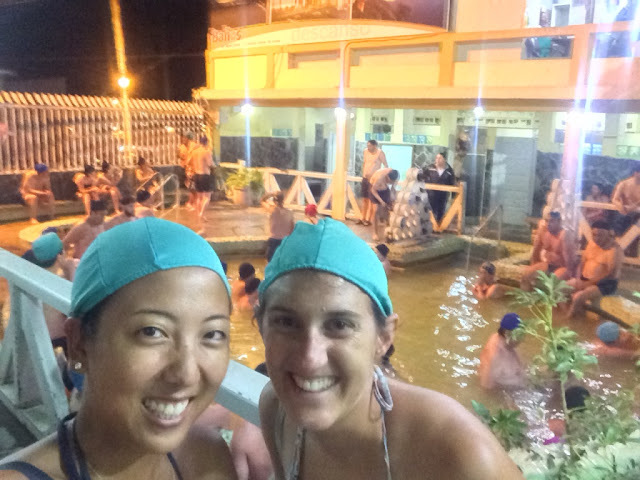 That evening, we hit up the city's main hot springs - it's one of the main three (the other two are farther outside of the city), is located right in town (under a waterfall, no less), and is the only one open in the evening. And they made us rent these stunningly attractive swim caps. Also, anyone have any idea why portly old men love thermal baths so much?? One of the main pools, stuffed to the brim with people, but under a waterfall! 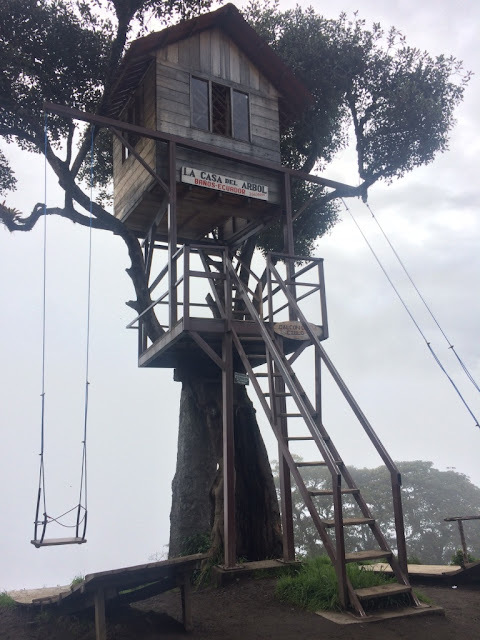 The next day, Nadine and I went for a hike - there's a place called La Casa del Arbol that I was dying to check out, because it's basically a treehouse with long swings attached on the edge of a mountain, where you can "swing over the edge of the world." Or something equally dramatic-sounding like that. 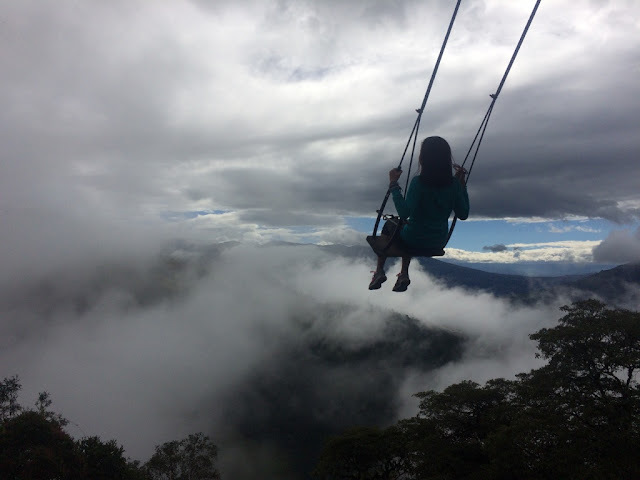 There's a local bus that can take you out there, but Nadine and I were feeling adventurous, so we hiked there, despite all the locals' disbelieving faces (which basically said "WHY would you hike there when you can TAKE A BUS?") when we asked them more info about the hiking path. 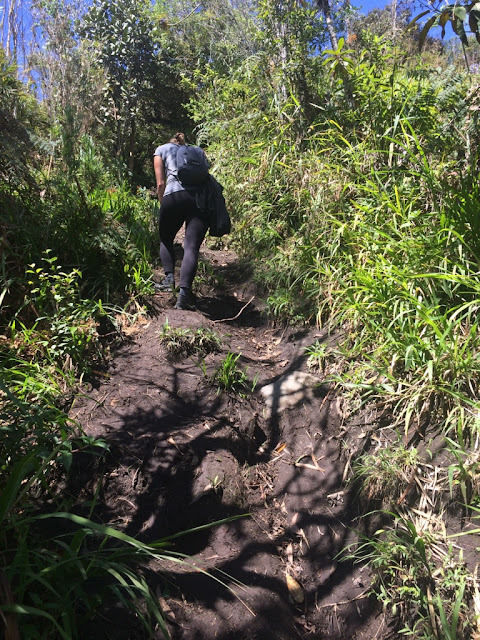 I'm now going to use quotations around "hiking path", because calling this thing a 'path' is being generous. The beginning of the path was fine and paved and led to some awesome lookouts over the city. But then it turned into this weird, goat-path-looking, muddy, steep, hot ratchet mess of a path. Add to the fact that it had rained in the morning, and the path was super mucky and winding and it disappeared a lot and we had to hunt it down. And we didn't encounter a single other person the entire time. 2.5 hours later, we arrived! La Casa del Arbol! Complete with two swings. 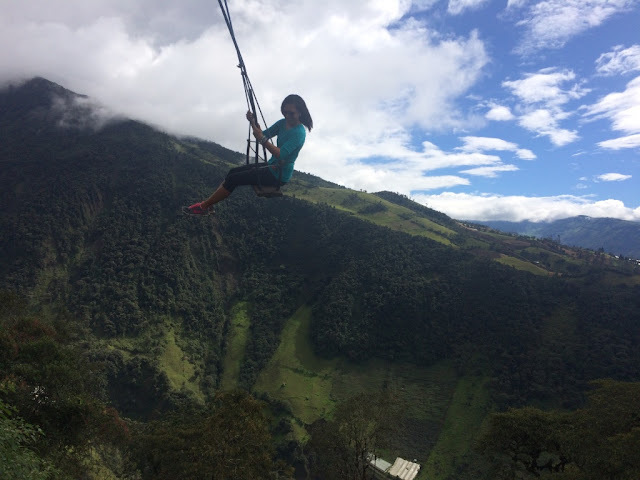 The employee also twisted the swing so you'd swing wildly in every direction. This was slightly terrifying. 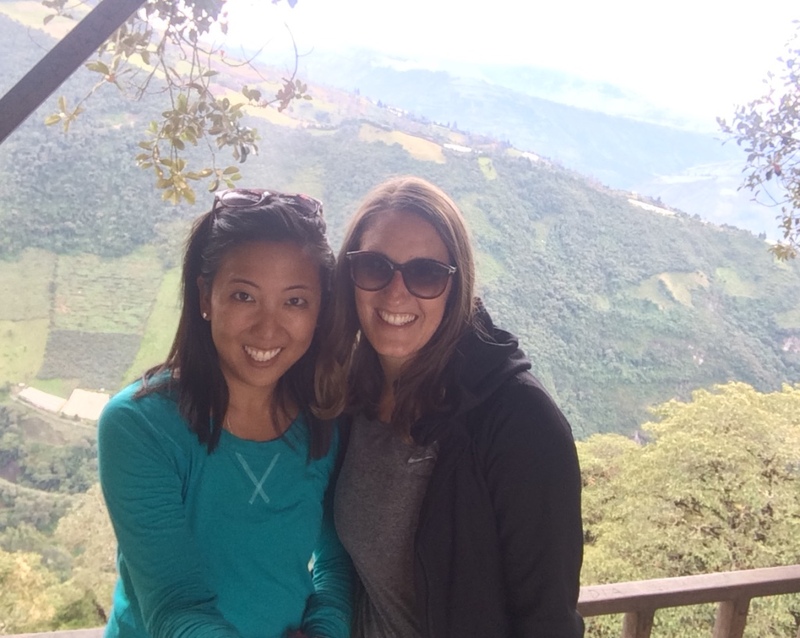 Nadine and I climbed to the top of the treehouse for more canyon views. And yes, those are our sweet Galapagos tans that are blinding you. 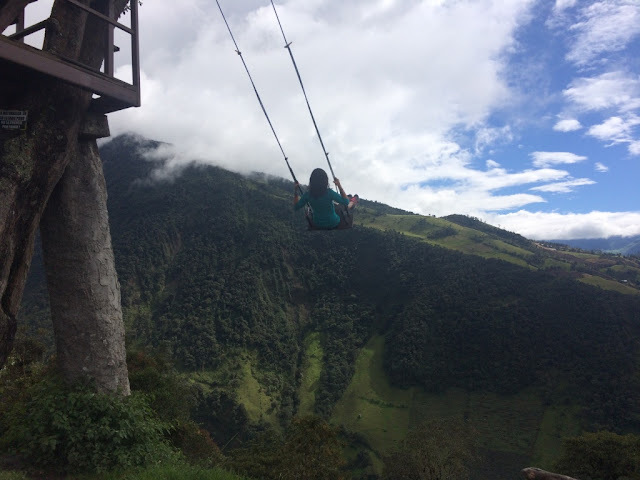 The entire place also had a giant zipline, more swings, and an adult-sized see-saw. It was basically a playground for adults. Fittingly, I had the best time ever. 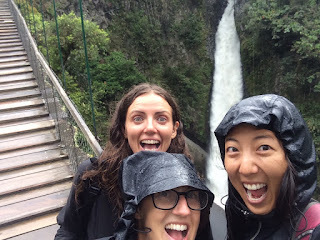 We took the bus back down to town (but only because we didn't want to die going down the steep, muddy goat path), and met up later that evening for dinner with Luci, the Italian girl who was on our Galapagos cruise - she had just arrived in Baños as well. 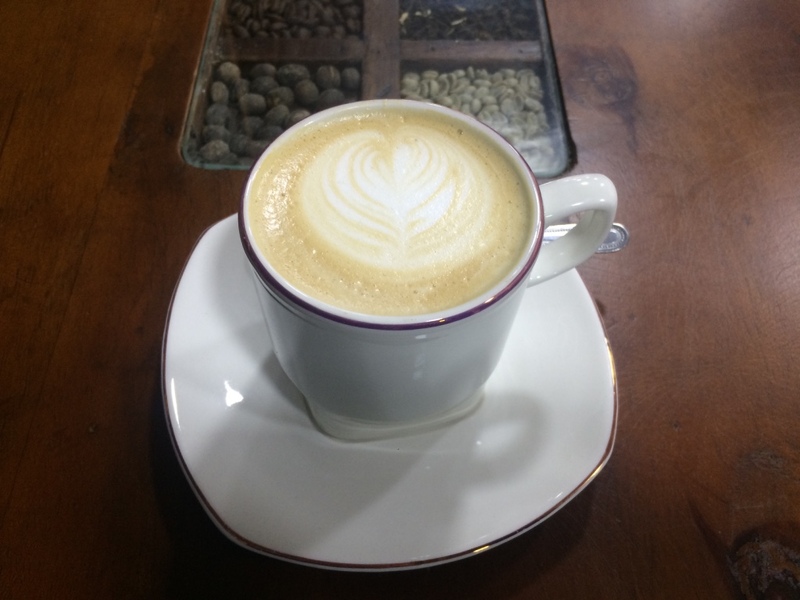 Nadine and I had this delicious chai latte every afternoon in Baños at this adorable, adorable coffee shop by our hostel called Milk & Honey. This is what I mean when I say that Baños was super cozy - we already had established routines in the couple days we were there. 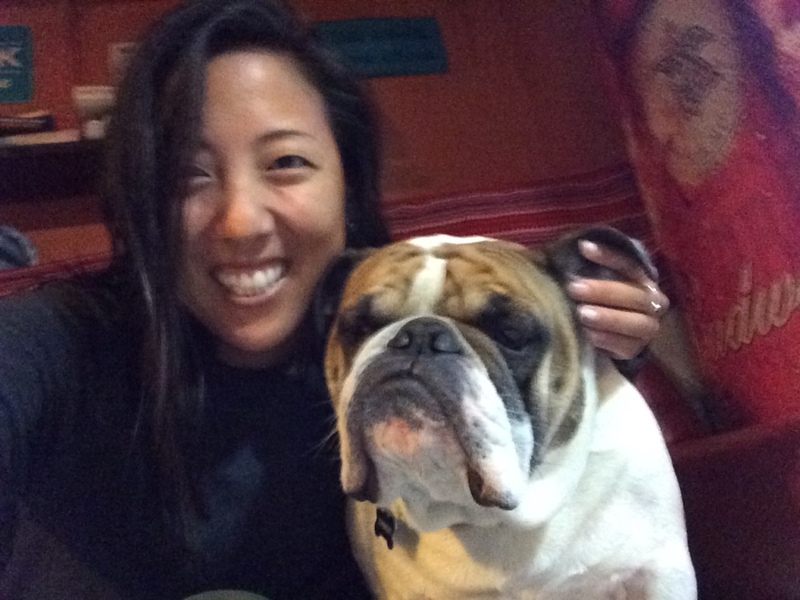 AND THIS PHOTO IS ONLY BECAUSE I CAN NEVER RESIST TAKING A PHOTO WITH ALL THE HOSTEL DOGS. How CUTE is he. 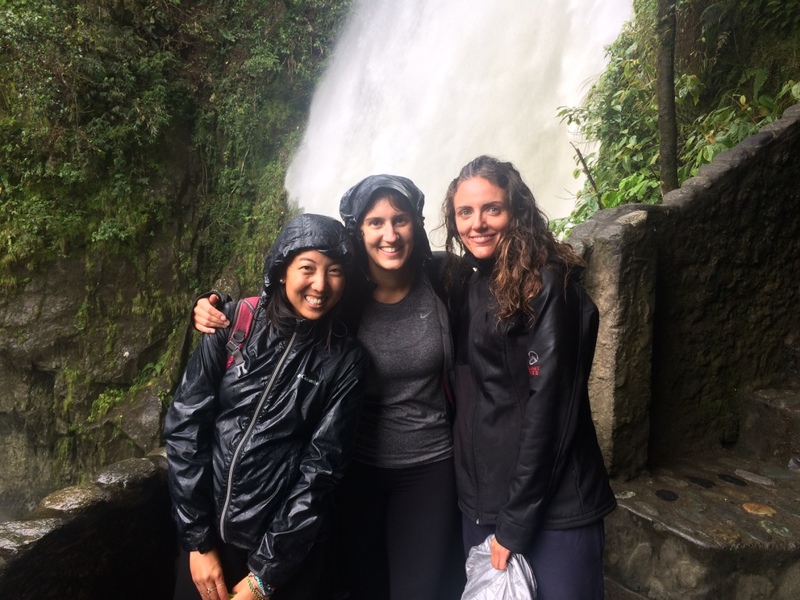 The next day, Luci, Nadine and I rented bikes to bike along a common route outside town called "Ruta de las Cascadas" (Route of the Waterfalls). 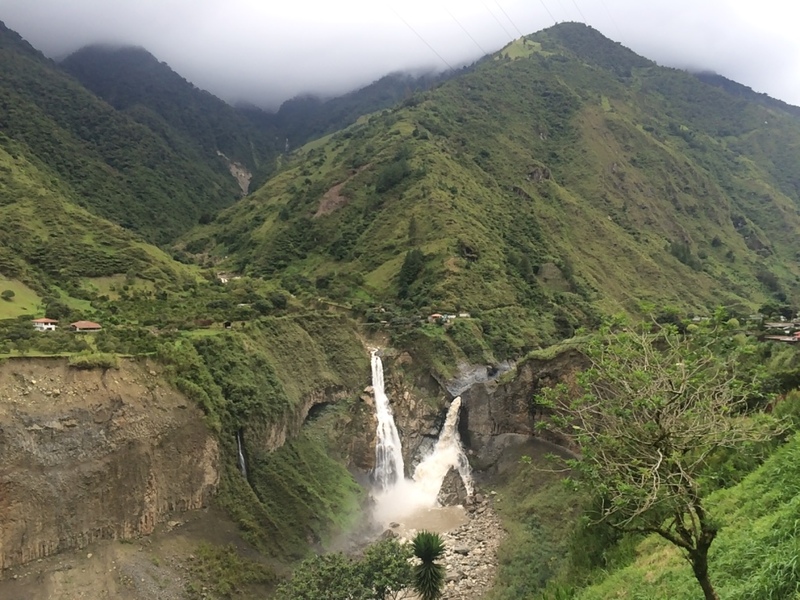 There are tons of waterfalls in and out of Baños, and this route takes you along some of the most stunning ones. The "biking route" was more like "riding your bike on the massive mountain highway and praying that cars see you and avoid hitting you." 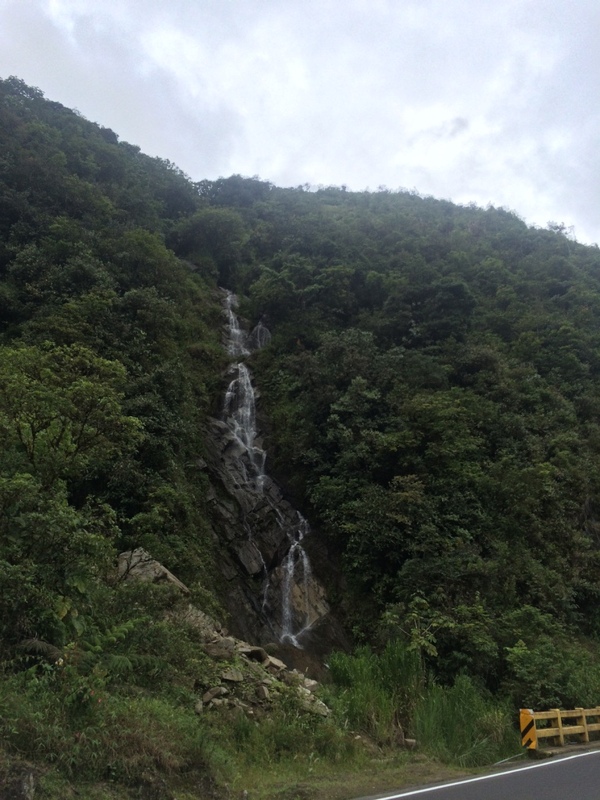 Anyhow, we finally reached Waterfall #1. 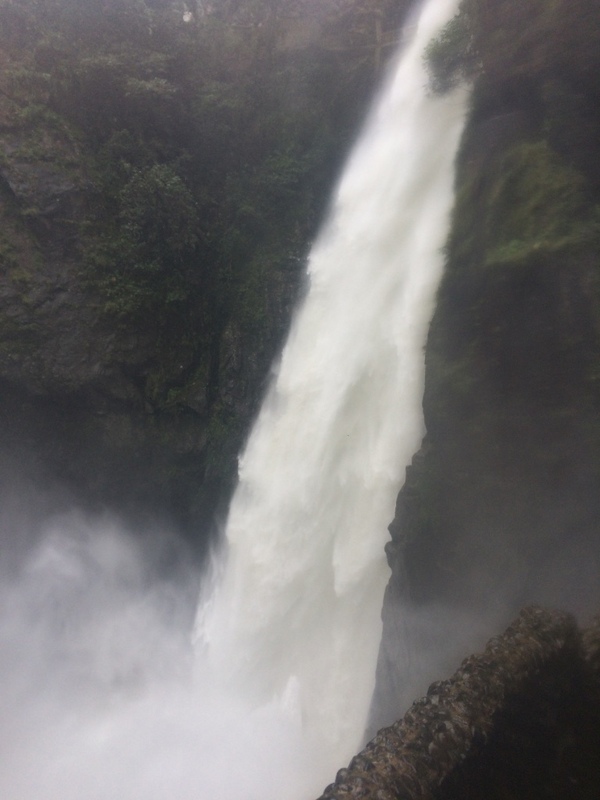 There were seven main falls on the map we had, so we tried to visit them all. I had the naive hope of posing next to them with the waterfall # on my hand, but things quickly fell apart after this photo. We missed seeing certain waterfalls, and there were tons of others that were unmarked, and we couldn't tell what was a legit waterfall and what wasn't. 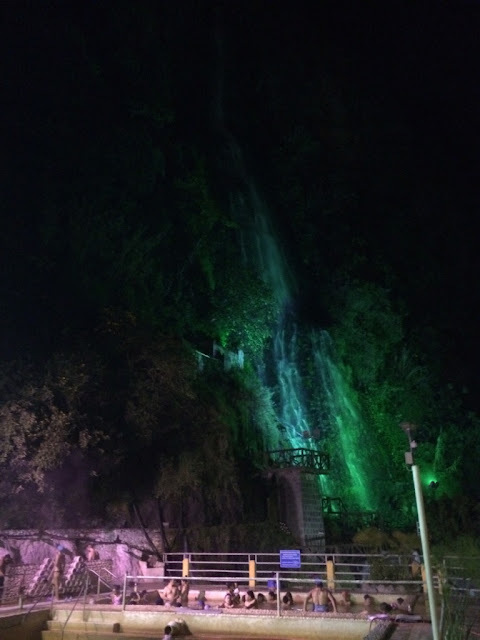 .....because here is Waterfall #3. What happened to #2?? Where was it? How did we miss it? 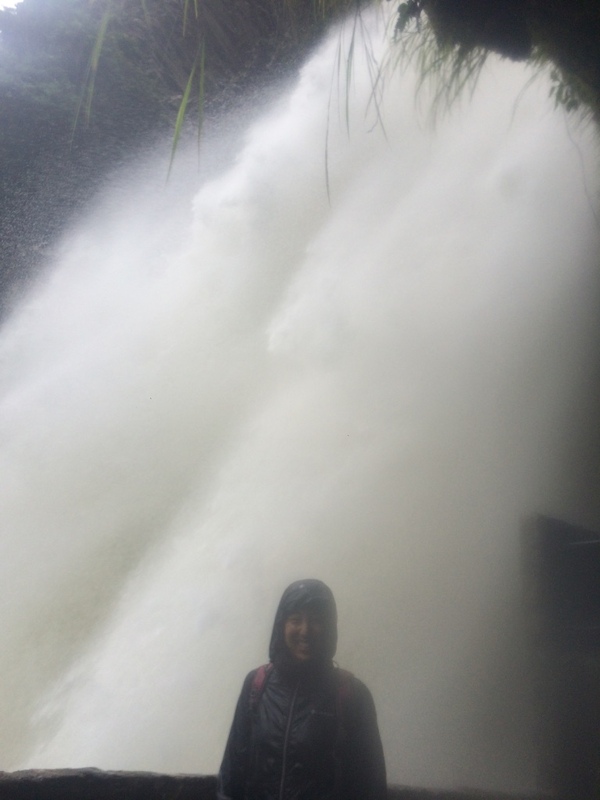 Is this one of the waterfalls on the map, or just a rando?? I give up. Here is another one though. We finally reached one of the main waterfalls, called Pailon del Diablo (Devil's Cauldron) - this one lets you hike down to the waterfall itself. 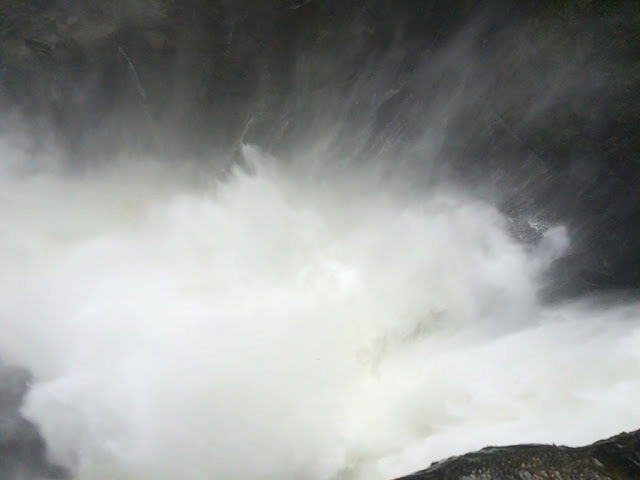 I realize this just looks like a hot mess of water, but the force of the water was HUGE. Luci, Nadine and I. Very wet. 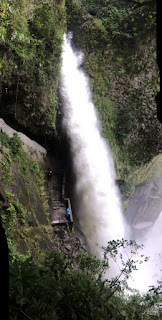 We walked around awhile, and then rode our bikes to another viewpoint of Pailon del Diablo. At the end of the Ruta de las Cascadas, there are shuttles that take you and your bike back to Baños. 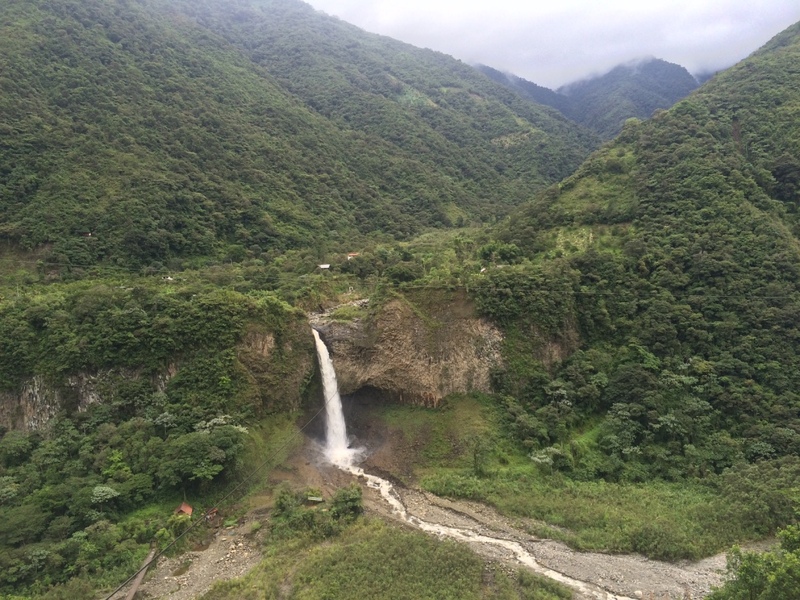 This is because the route out to the waterfalls is about ~15km, but it is mostly downhill, so it goes quickly. This means the route back, however, is pretty difficult and involves a very steep incline on highway roads. Most people opt for the shuttle back to town. 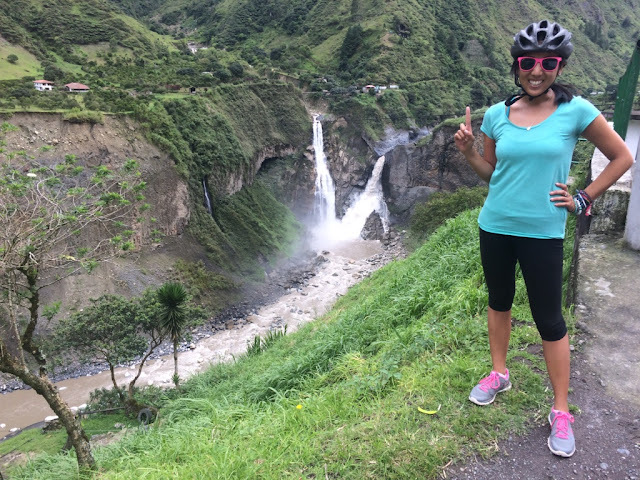 Nadine chose to ride her bike back to Baños, while Luci and I opted to take the shuttle (in my defense, there were a decent number of hills getting there as well!). We arrived at the shuttle stop to find one just pulling away. When we asked the next shuttle when he was leaving, he assured us that it would be very soon. You can't really trust vague answers like that out here, so I gently pressed him further: could we possibly be waiting 5 minutes? 20 minutes? An hour? The driver looked at me and scoffed when I said an hour: "Una hora?? Noooooo, no, nunca." He estimated it would be 20 minutes. An hour later, Luci and I were still there. I had (in my opinion, adorably) harassed the driver a bunch of times at this point, being like "Vamos? Vamos?" By the time we hit the hour mark, and the driver still had not made a move (he was waiting for more people to make more money, clearly), I was getting incredibly irritated. I explained to him that he had laughed at me when I asked if it was going to be an hour, and now it had been an hour, and we still weren't moving! I understand he wants to make more money, but he should have been honest in the beginning and then we wouldn't have waited. He kind of lazily glanced at me and threatened that he could take our bikes out of the shuttle and we could ride back if we didn't want to wait. Luci and I are both very high-spirited, principle-based people. Maybe too much so. So we were both like "FINE", and took our bikes out, and proceeded to get on them to ride away and make a point. Now the driver has to wait longer for even more people. So HA. 5 minutes in, as I was puffing my way up a huge highway incline, I was instantly regretting our principle-based, spur-of-the-moment angry decision. Besides, how embarrassing would it be if we were struggling up the mountain on our bikes and the rude shuttle man passed us in his shuttle? I had noticed, at this point, that a lot of the cars whizzing by us on the highway were trucks, so I stopped the bike and consulted with Luci that maybe we should try hitching a ride back to town? Luci instantly agreed. I think she was hating the ride as well. We pulled over to a little inlet, and stuck our thumbs out for a ride. About 5 trucks whizzed by us without even slowing down, though we both tried smiling, laughing, giving pleading looks, sad faces - the works. And then. A giant, long-haul private passenger bus appeared. It slowed down, and we realized at that moment that it was because the inlet we'd pulled over in happened to be a bus stop. So we looked past it and kept on trying to hitch a ride. Until an angel of mercy in a bus uniform stepped down off the bus, looked at us, and said he had room under the bus for our bikes. WHAT ARE THE CHANCES. 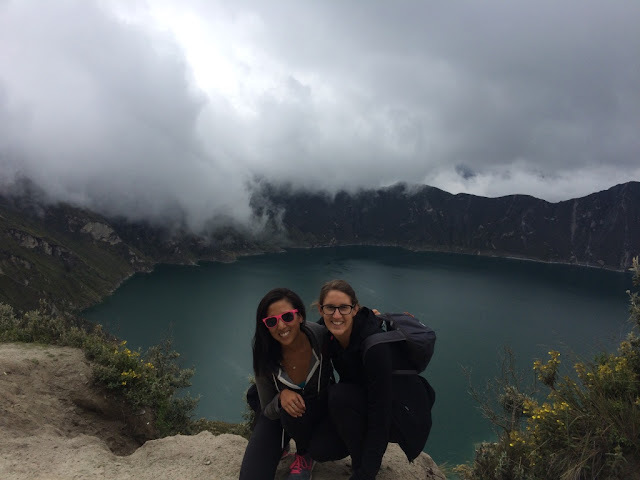 Luci and I were giddy beyond belief as we stepped onto the bus, with its air-conditioned plush reclining seats, as all the other long-haul passengers stared at the two sweaty foreign girls in bike helmets laughing and high-fiving each other all the way to our seats. It only cost us a $1 to ride back to Baños in comfortable style (the shuttle was charging $2 and we would have had to ride in the bed of the truck), and we'd only had to ride our bikes for 5 minutes in total. 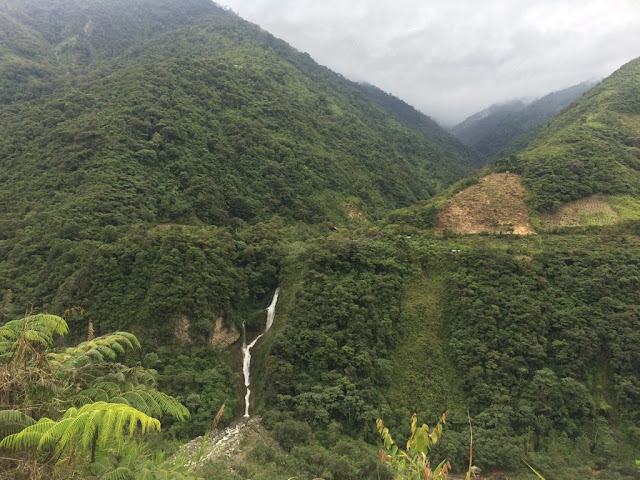 When the bus dropped us off back in Baños 20 minutes later, we collected our bikes and thoroughly thanked the bus driver for saving our lives. It just goes to show. Things work out. And often in ways you never even saw coming. 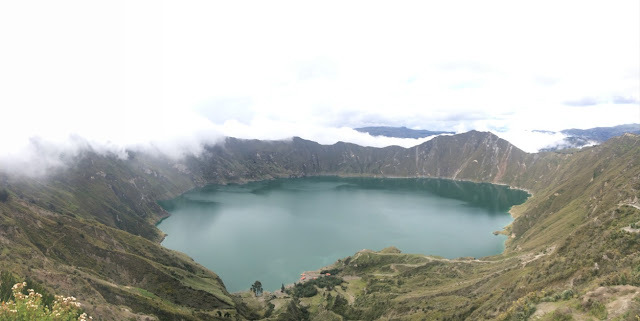 Day 4, we left Baños to journey to a crater-formed lake called Quilotoa. This is not really anywhere near Baños (it's like a 4-hour bus journey), but I didn't know where else to tuck it in so I'm putting it here. 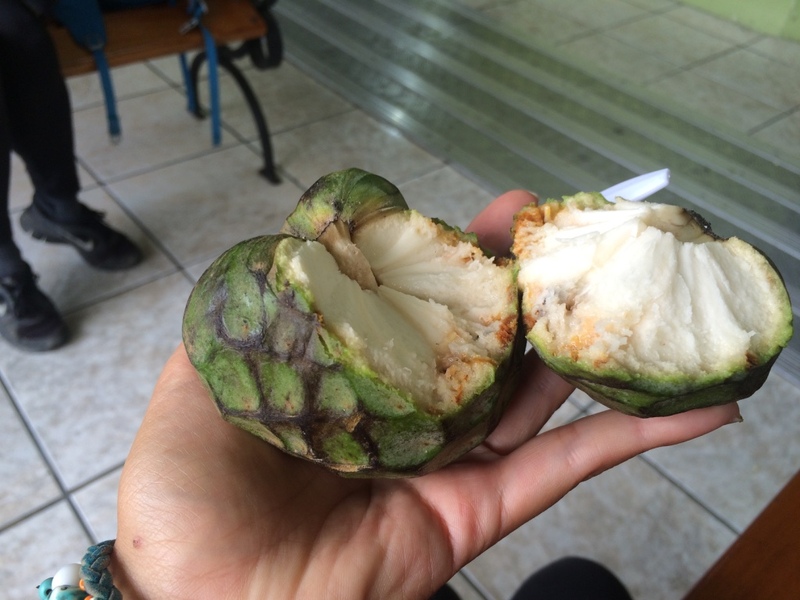 I finally got to try a chirimoya for breakfast! And it was, indeed, the most delicious thing in the world. And the drive out to Quilotoa was SO, so pretty. And here is Quilotoa! It was formed ~800 years ago due to a volcano eruption which then collapsed, forming this huge crater. Over time, it filled with water to become a crater lake, and the water inside is super-green due to all the minerals. 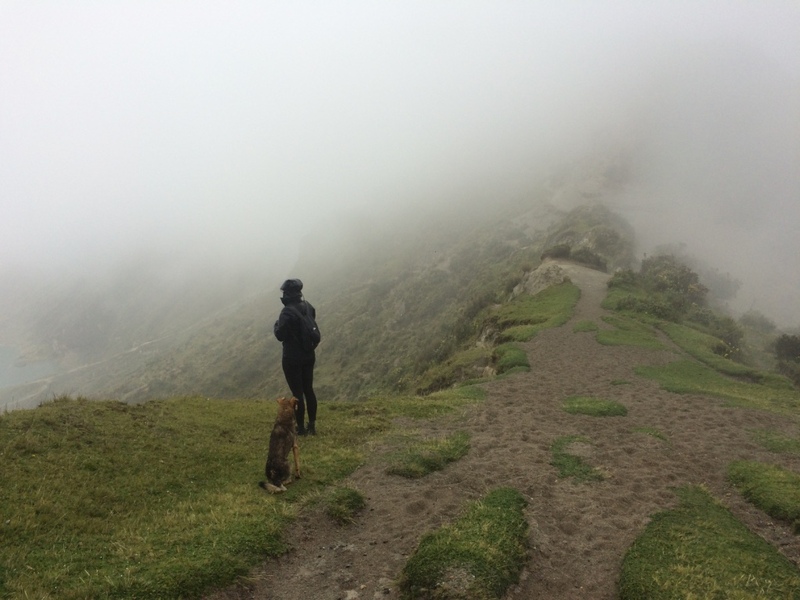 You can hike around the entire crater in ~4 hours, which we wanted to do, but do you see the ominous fog rolling into the crater? It started raining. 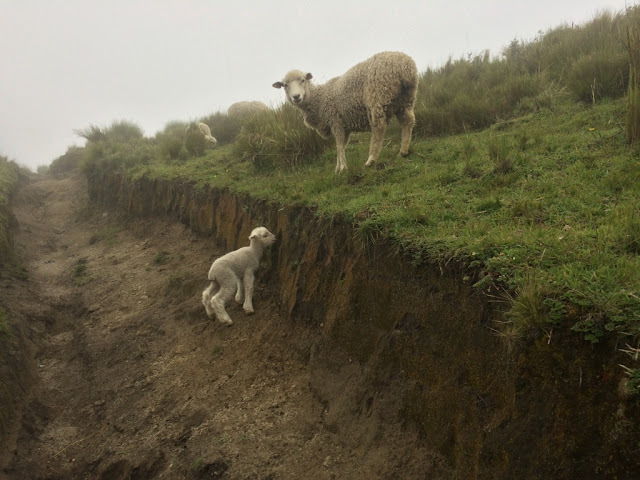 And it was so slippery that this baby lamb couldn't get up to its mother. The entire area fogged over and started to downpour. 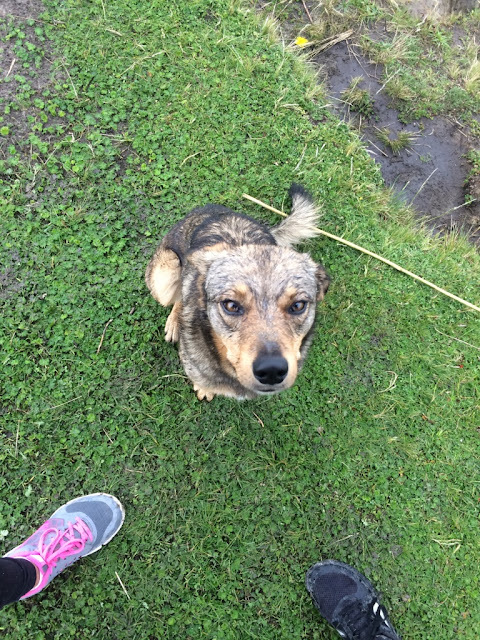 And this dog tried to follow us. 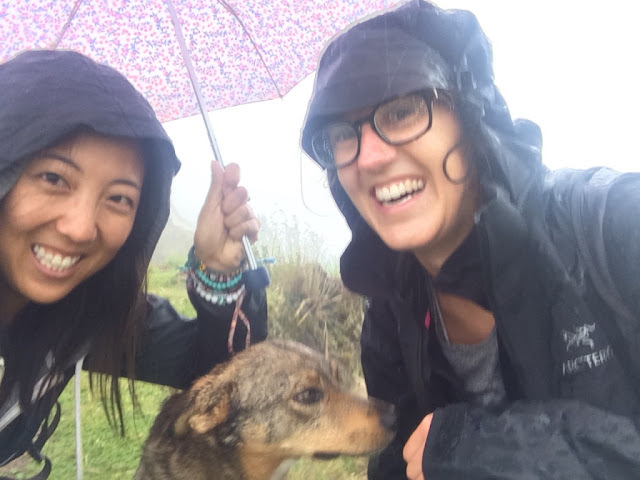 Group shot of us under the umbrella, right before we decided to retreat from our hike before we died of lightning strikes or flash floods (Luci had wisely abandoned the hike about 15 minutes before us). Arriving back in the tiny town near Quilotoa, we found a warm cafe to dry off in. Which also had amazing WiFi. 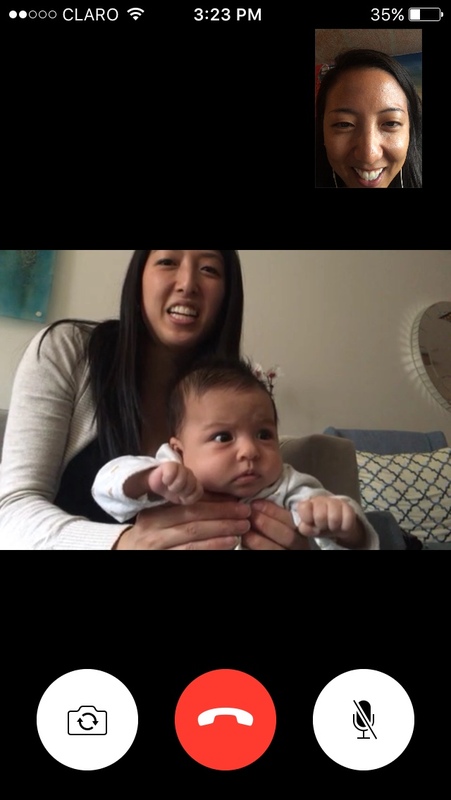 It's never disappointing to miss a hike in the rain when you get to FaceTime with the niece instead! 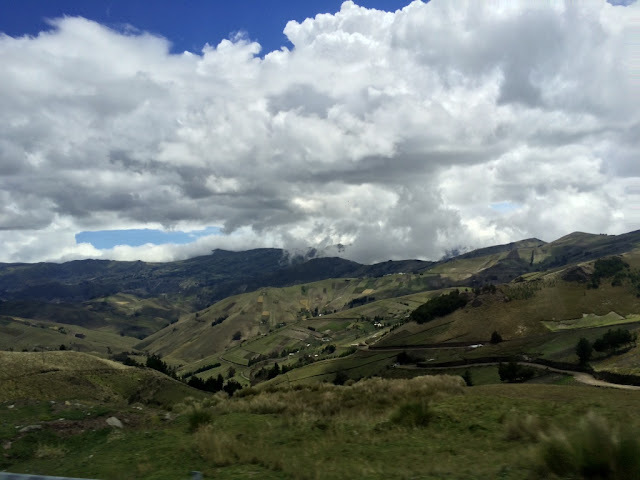 That evening, we took a series of buses out of Quilotoa to get to Quito. 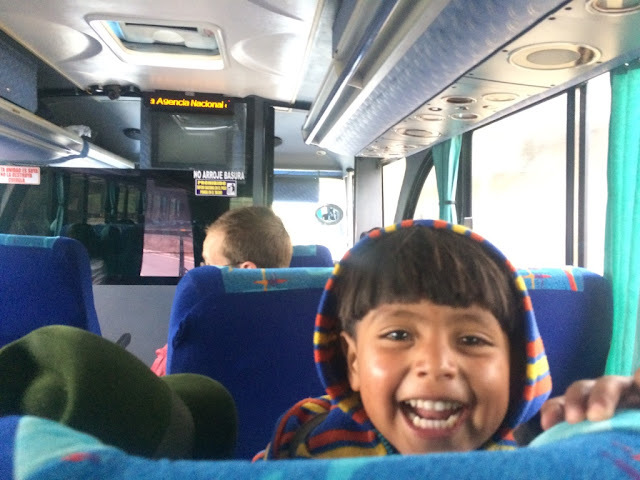 And on our first bus, this adorable local boy kept laughing and wanting to play peek-a-boo. He would dissolve into laughter whenever we popped our heads out. It was the CUTEST.